July 1914: he made his first appearance on stage, at the Kabukiza, where he received the name of Bandô Tamasaburô IV and performed in the drama "Tengajaya". January 1926: Bandô Tamasaburô IV took the name of Bandô Shûka III at the Imperial Theater, playing the role of Ushiwakamaru in the dance "Kuramayama". June 1929: premiere at the Imperial Theater of Tsubouchi Shôyô's dance-drama "Ryôkan to Komori" [more details]; Shûka played the role of the komori. 16 June 1932: his adoptive father Morita Kan'ya XIII died. 1932 ~ 1937: he was a regular member of a troupe of young actors, called Seinen Kabuki, which performed at the Shinjuku Daiichi Gekijô. January 1935: Bandô Shûka III took the name of Morita Kan'ya XIV at the Kabukiza, playing the role of Konishi Yukinaga in the drama "Mikka Taiheiki". 1947 ~ 1953: Kan'ya spent a lot of time in the cinema world, acting in movies like Itô Daisuke's "Surônin Makaritôru" (1947), "Otomi to Yosaburô" (a movie adaptation of the Kabuki drama "Kirare Yosa") and Nakagawa Nobuo's "Edo no Hanamichi" (1953). July 1953: revival at the Meijiza of Kawatake Shinshichi III's 1878 drama "Tsûzoku Saiyûki"; Kan'ya played the role of Chohakkai [casting]. July 1954: revival at the Kabukiza of the dance-drama "Oshidori" as part of a regular Kabuki program; Kan'ya played the role of Matano Gorô Kagehisa [more details]. February 1955: Izumi Kyôka's drama "Tenshu Monogatari" was staged for the first time with Kabuki actors, at the Kabukiza; Kan'ya played the role of Zushonosuke [casting]. July 1956: revival at the Kabukiza of Tsuruya Nanboku IV's drama "Sumidagawa Hana no Goshozome", commonly called "Onna Seigen"; Kan'ya played the role of Yoshida Matsuwakamaru [more details]. March 1959: revival at the Meijiza of the dance-drama "Kumo no Ito Oyozume Banashi"; Kan'ya played the role of Usui Sadamitsu [more details]. January 1960: premiere (or revival?) at the Kabukiza of the dance "Kuruwa Sanbasô"; Kan'ya played the role of the taiko mochi Tôchû [casting]. February 1960: premiere at the Kabukiza of Uno Nobuo's drama "Shiranui Kengyô"; Kan'ya played the role of Kurakichi, later Kôkichi [casting]. 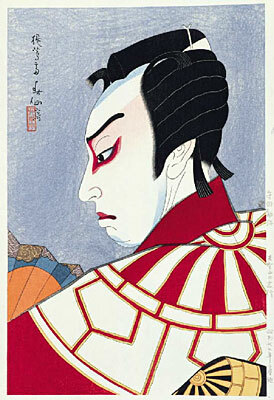 November 1961: premiere in Kabuki at the Ôsaka Shinkabukiza of Hôjô Hideji's drama "Korikori Banashi"; Kan'ya played the role of Inosuke [casting]. November 1962: revival at the Kabukiza of the drama "Fudô", which belonged to the Kabuki Jûhachiban; Kan'ya played the roles of Sakuramachi Kiyofusa and Fudô Myôô [more details]. December 1965: Kan'ya and his adopted son Bandô Tamasaburô V achieved a great success at the Kabukiza by playing the roles of Tonase and her daughter Konami in the michiyuki "Michiyuki Tabiji no Yomeiri". December 1966: second month of the opening ceremony of the National Theatre with the full length performance of the classic "Sugawara Denju Tenarai Kagami"; Kan'ya played the role of Takebe Genzô [casting]. January 1967: revival at the National Theatre of "Narukami Fudô Kitayama Zakura"; Kan'ya played the role of Hayakumo no Ôji [casting]. March 1967: revival at the National Theatre of Tsuruya Nanboku IV's masterpiece "Sakura Hime Azuma Bunshô", which was supervised by Gunji Masakatsu; Kan'ya played the role of the priest Seigen [casting]. May 1968: revival at the National Theatre of "Ura Omote Sendai Hagi"; Kan'ya played the role of Hosokawa Katsumoto [casting]. April 1971: revival at the National Theatre of Nagawa Shimesuke I's drama "Sumidagawa Gonichi no Omokage"; Kan'ya played the role of Jinzaburô [casting]. December 1974: Kan'ya appeared on stage in Tôkyô for the last time, playing the role of Yuranosuke in the 9th act of the classic "Kanadehon Chûshingura", which was staged at the National Theatre. January 1975: Kan'ya appeared on stage for the last time, in Nagoya at the Chûnichi Theatre, where he played the role of Matsuura Shizunobu in the drama "Matsuura no Taiko". 28 March 1975: Kan'ya died. Morita Kan'ya XIV was a talented tachiyaku actor, excelling in nimaime roles and who was deeply influenced by the pre-WW2 star Ichimura Uzaemon XV. Instead of the usual kata deviced by Onoe Kikugorô VI for the roles of Sanemori ("Sanemori Monogatari") or Benten Kozô ("Shiranami Gonin Otoko"), he preferred to use Ichimura Uzaemon XV's ones and, therefore, helped to their preservation. He was able to play a broad range of roles: if we take the example of the classic "Kanadehon Chûshingura", he had the opportunity to play during his career the roles of En'ya Hangan (act I), Kô no Moronô (act I), Momonoi Wakasanosuke (act III), Hayano Kanpei ("Ochiudo", act V, act VI), Bannai ("Ochiudo"), Sadakurô (act V), Fuwa kazuemon (act VI), Senzaki Yagorô (act VI), Teraoka Heiemon (act VII), Tonase (act VIII), Kakogawa Honzô (act IX), Yuranosuke (act IX) or Hattori Itsurô (act XI). At the end of his career, he often took part in rare revivals produced at the National Theatre. Morita Kan'ya XIV's best roles: Kataoka Naojirô ("Naozamurai"), Sakuramaru ("Ga no Iwai"), Yosaburô ("Kirare Yosa"), Einojô ("Kagotsurube"), Yoemon ("Kasane"), Hayase Iori ("Tengajaya").